If You Love Your Woman For God’s Sake Don’t Do Housework! I heard on the radio that a recent study has found that women who do an average of 4 hours a day of housework have a 30% less likelihood of getting some kinds of cancer…. 30%. For God’s sake, if you love your woman, don’t do housework! If you really love her, leave stuff out, don’t pick up after yourself, use more dishes. Forget about being emotionally available, pee on the toilet seat! 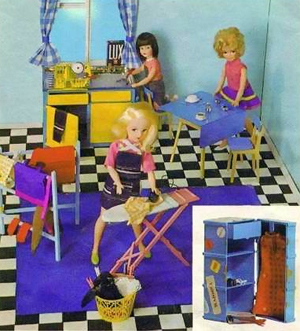 We men have known for some time now that women should be doing all the housework. It was just a matter of time before science assured us that we have been selfless in our desire to help our women be all they can be. What man wouldn’t want his sweetheart to have a full and rich life? So show your love, let her do what obviously she was created to do! Science proves it! Don’t you love your girl enough to help her stay healthy! Quit being selfish! Don’t do housework! 🙂 too funny. I followed your link, but didn’t see anything about cancer… what I did see was that divorce rates are higher when men help, which I find hard to believe. The only thing I can figure is that the man is not doing things correctly, which causes problems in the marriage because they fight over it… OR… the woman has to nag and fight with the man to get him to help…. and divorce is the end result because the man is tired of being nagged at to clean. Not sure why this is an age-old battle though. Seems like common sense. You make a mess, you clean it. You help or contribute to making a mess, you help clean it. No reason it should all fall on one person, unless they happen to like doing that kind of stuff. Hmm tongue in cheek this article? ..but I did have a laugh. As long as my wife doesn’t see it! are men not prone to cancer….if they do not work out ???? we women are also very selfish and dont want our hubby to have any kind of desease so we want to leave some work to them…..u know this is the reason why the life expectancy rate for men is less than women….atleast in india…..because women do all the household work and remain fit and men eat n only eat…..get obese….or diabetes….and die ! this is a very nice excuse of pulling women down from what they are ought to do in their respective life…..women are not born to take care of kids and house only…..they are entiteled to do much more…..only if they get non-lazy husbands ! she doesn’t read my blog! You silly man I rue this one. No men ITS A LIE. Do housework please. Pretty please? Leave the dishes that takes stress off and helps our over used knuckles….